Above: A before and after shot of the 43rd Street and Upton Ave. corner. 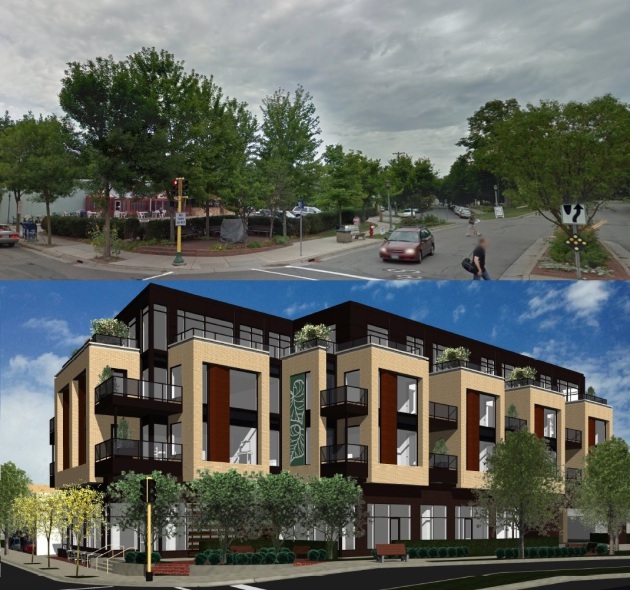 After years of neighborhood opposition in Linden Hills, particularly over building heights, apartments will soon rise on the corner of 43rd Street and Upton Avenue S.
The Minneapolis City Council gave final approval Friday to a four-story, 29-unit apartment building on a corner formerly occupied by a Famous Dave's restaurant. Though relatively small, the project signals the end of a years-long effort by well-organized neighbors to shape development on the corner. It is the fourth proposal for that corner to reach City Hall in just the last three years -- others failed to launch or were rejected by the city -- but developer Clark Gassen assured it would be the last. "We have a waiting list of people that want to move into this development. This project will break ground," Gassen said, noting that every project he has been approved for has broken ground. Gassen has developed two notable Minneapolis projects in Uptown: the Walkway (with a hot tub cantilevered over Lake Street) and the Edgewater Condominiums beside Lake Calhoun. 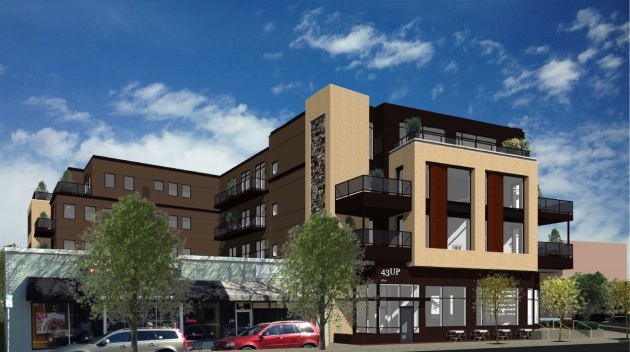 The 43rd and Upton project is slated to break ground in spring 2016. Gassen said it will take 10 to 12 months to complete. The project drew criticism of a well-organized group of neighbors, who said nearby houses would be "obliterated" by the four-story height of the new apartment building. Gassen said they have been working with neighbors to tweak the project, particularly around building materials and color palettes. He hopes to hire local artists to install art in the pocket park on the corner. Calling it the "first true, boutique, New York-style apartment building in Minneapolis," Gassen said the project will be less focused on amenities than other recent developments. Above: A southwest view of the future development at 43rd Street and Upton Ave.
About half of the ground-floor retail space will be occupied by a to-be-named restaurant. Another neighbor, Larry Lavercombe, filed an appeal aimed at improving the overall design of the building. He sounded optimistic about the project Friday afternoon. Council Member Linea Palmisano, who represents the area, apologized at Friday's council meeting for personal attacks that opponents have been lodged against city staff.